"FUBAR: American History Z" Released! 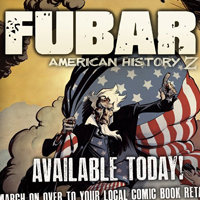 The newest volume of the New York Times Bestselling series, FUBAR: American History Z was released today! March on over to your local comic book retailer to pick up your copy, and keep an eye out for the FUBAR Free Comic Book Day special (available to read online for free). I'll be signing copies of this phonebook-sized anthology of zombie pulp madness down at Fantasy Comics on May 5th!